Have you ever felt moody, unhappy, depressed? Have you ever felt you cannot organize your life or your relationships? This could mean you have an imbalance in your Chakras and you need to heal them. 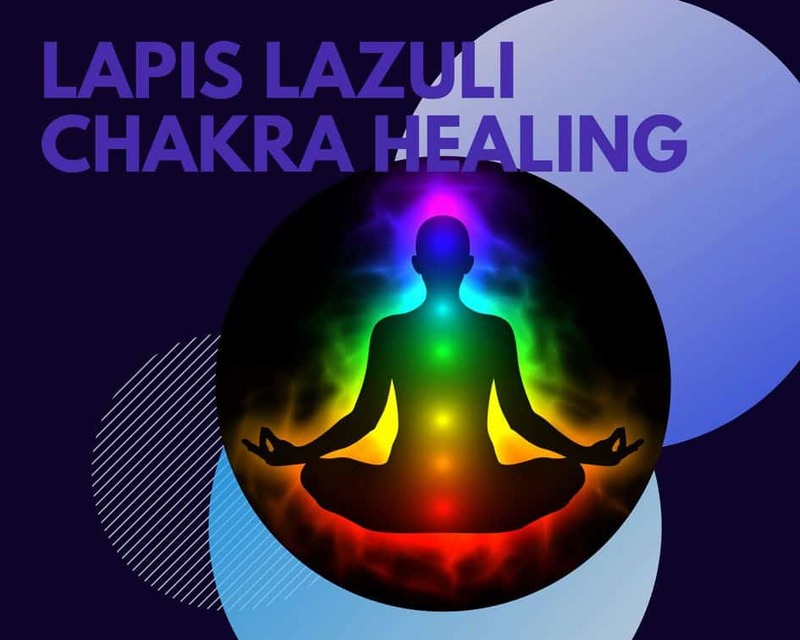 In Lapis lazuli Chakra Healing we’ll learn how to heal your Chakras and you will learn which marvelous stones are the adequate for each Chakra. Spinning circles of energy located in the body from the Crown to the Base. This is what we call Chakras. There are 7 main Chakras but there are other minor Chakras in the body. They help maintain your physical mental, emotional and spiritual balance. To heal the Chakras we use crystal gems, colors and also scents. Different crystals are listed for each Chakra point. Each Chakra can be healed with different stones and the same crystal can be used in several Chakra points. This Chakra is responsible for grounding and is said to be an energizer to the physical body. If the base is weak, you may feel like you are unhappy with your body size or shape. Like if you are out of control of your life and you can’t gain control. Instead, if it is overactive you can often explode angrily at the smallest things. To heal the root or base Chakra is recommended using red and black crystals, such as Red Garnet, Red Jasper, Smoky Quartz, Black Onyx and Hematite. Helpful when relating to people and also for sexual energy and eating disorders. When this Chakra is unbalanced you may feel lethargic and even depressed and if it is overactive yo may feel a constant frustration. It is recommended to use Amber, Carnelian, Orange Calcite, Tiger’s Eye and Sunstone. When you have this Chakra balanced again, you will begin to feel excitement, inspiration and motivation again. Check our Amber Healing Properties posts, to learn more about the influence of amber onto the human’s health and body. I promise, you will be surprised! Good for cleaning thoughts and for establishing your Power Centre. Unbalanced, it makes you feel as if you can’t gain control over your life. If it is overactive you will act as a control freak. For the solar Chakra healing we recommend Amber, Citrine, Yellow Jasper, Rutilated Quartz and Pyrite. When you have your Solar Chakra balanced, you will feel motivated, focused and confident in your decisions. Responsible for both giving and receiving universal and unconditional love. As well as feelings of self-worth. If you find yourself having problems in your relationships it means you have a weak heart Chakra. If it is overactive you get to attached to things and overly emotional. To heal the Heart Chakra use green and pink heart chakra stones like Chrysoprase, Aventurine, Rose Quartz or Rhodonite over your heart to open it up to all types of love. When it becomes balance you will radiate love of all kinds. It is the communication Chakra and it encourages the ability to express oneselfin an honest and clear way. When your throat Chakra is weak you will be unable to speak your truth and express yourself. When it is overactive you will often speak before you think. 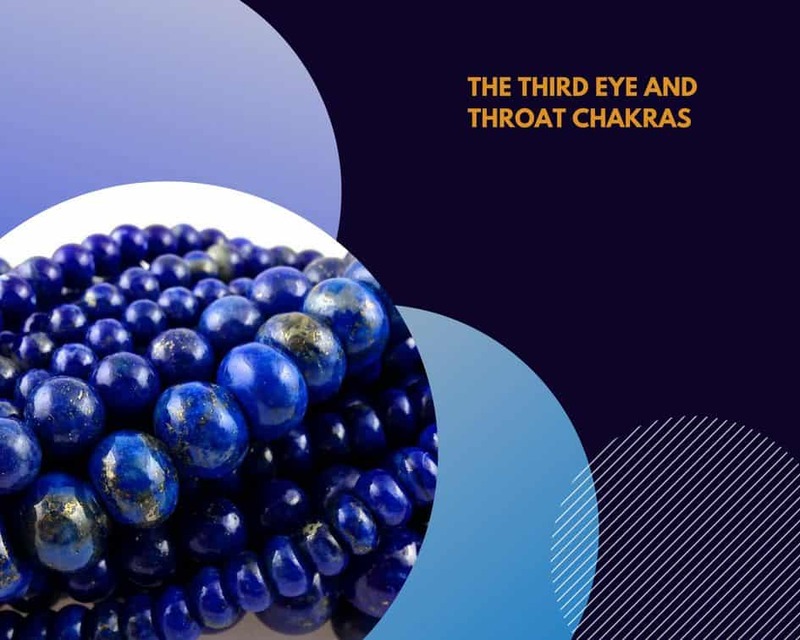 To heal the Throat Chakra it is recommended to use Angelite, Sodalite, Blue Apatite, Aquamarine and the magical Lapis Lazuli on your throat. It is the center of intuition and psychic abilities. Lapis Lazuli activates the psychic centers at the Third Eye and balances the energies of the Throat Chakra. If you feel that you cannot visualize and organize your life very well it means it is under active. When it is overactive you may experience nightmares each night. To heal this Chakra use Angelite, Amethyst, Fluorite, Iolite and Lapis Lazuli over your Third Eye. It is associated with opening up to infinite energies and developing a connection to your own higher self and mind. When you can’t think clearly under stress means your Crown Chakra is unbalanced. To heal this Chakra use clear Quartz, Amethyst, Selenite and Moonstone. The correct position to use crystal with the Chakras is to lie on your back. You need to go to a place where you will not be disturbed and will be allowed to completely relax and meditate for about 15-20 minutes. It is recommended to listen to meditation or relaxation music during this process. Then you have to place the appropriate crystal on the Chakra points. Try to feel comfortable and close your eyes. Breathe in slowly and deeply, hold for a few seconds and then slowly breathe out. Do this for several minutes. While you are doing this, clear and calm your mind and imagine that each time you breathe out you are releasing stress, worries and negative energies inside of you. 5 minutes should be enough. Imagine yourself being surrounded by a pure, bright white, loving light. This light is your protective energy which will remain surrounding your body during this exercise. It is best to always start from the 1st (Root/Base) Chakra and continue moving upwards to the 7th (Crown) Chakra. Start to focus and concentrate on the stone and its associated Chakra color and imagine that area being bathed in a pure clean strong color. You have to imagine it as a small vortex of spinning energy swirling from and around the stone and within you. You can see and feel the beneficial energy from within the gemstone being absorbed by the body. Spend 30-60 seconds concentrating in this energy. After this, move to the next stone add Chakra point and repeat the same process with its associated color. Continue with all the Chakra points until you reach the 7th (Crown) Chakra. When you have finished the process imagine each Chakra from the 1st to 7th along with its color and imagine the colored energy being absorbed into the body until its gone. This will close each of the Chakras, so they can return back to their normal functional state. After you have done this, take a few breaths and feel your body stretch. You have completed your Chakra meditation. The Third Eye Chakra is also called the Brow Chakra and is the center of our perception and command. We relate to ourselves through this Chakra. Our consciousness is located in this Chakra. When the Brow Chakra is in balance we see clearly and understand what we see. Our perception is high. We are open to new ideas, dreams and also visions. Through the Brow Chakra we can also control the flow of energy within all the Chakras. Lapis Lazuli is the stone of wisdom and is perfect for Third Eye Chakra. The Throat Chakra is the voice of the body. If it is blocked or out of balance, it can affect the health of the other Chakras. When the throat Chakra is in balance and open, we can bring our personal truth out into the world. 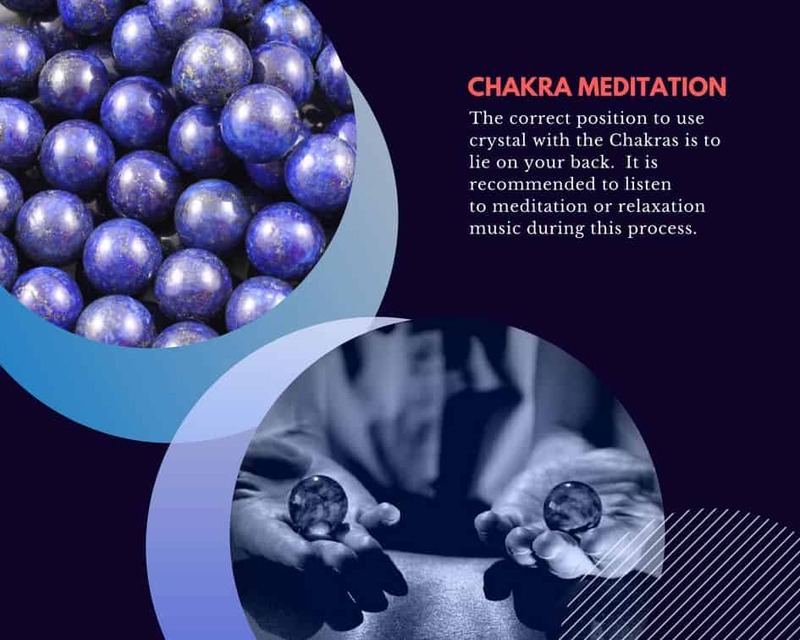 Blue crystal energy will unblock and balance the Throat Chakra. The darker shades of the blue carry the power of truth. That is why Lapis Lazuli is the crystal of choice for these Chakras. If you want to work with your Solar Plexus Chakra and Sacral Chakra, check our post about Amber Magical Properties. When you first purchase a stone in any form, you should always cleanse it. Why? Very simple. Since the moment when stone appeared in nature and until it arrives to your hands, it usually receives millions of different energies. From people who have observed them in a business. The energy from those who have picked them. The energy of animals that used stones to make their burrows. Climate changes, the sun, the moon. The energy of hate or rage when someone threw it to another person. You got that, right? If you work with these stones without cleansing, it would be chaotic and they will not serve their purpose. Furthermore, they can even worsen the state of your chakras. Sea Salt Cleanse: Place the stone in a bowl; pour sea salt over the stone for the night. Make sure the stone is covered completely with salt. In the morning place it in the sunshine to re-energize. Brown Rice Cleanse: Place the stone in a bowl, pour dry brown rice over the stone and leave overnight. In the morning put the stone under cool water and let it dry in the sunshine. But, none of these methods will work with Lapis Lazuli. 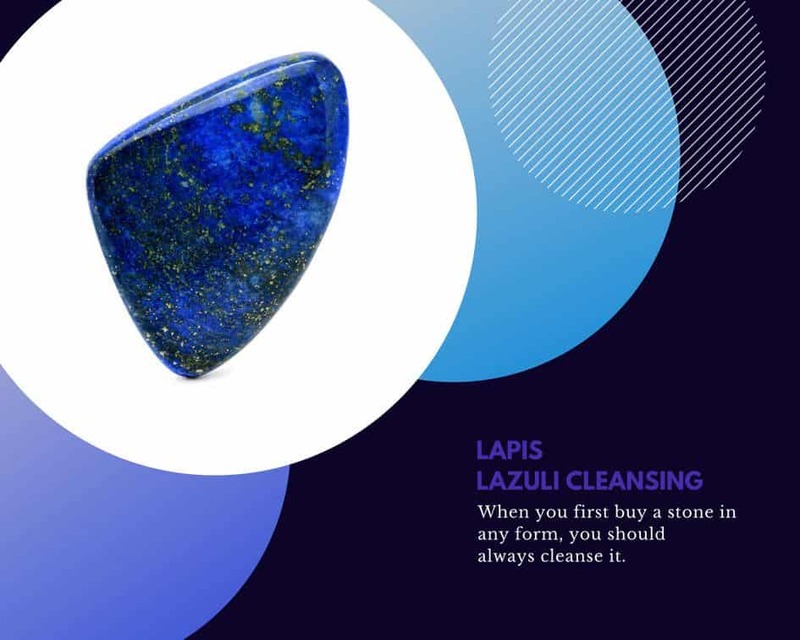 The water damages porous rocks and like you we all should know by now, Lapis is a very porous rock. Second of all, salt is also a damaging ingredient for our dear lapis. The method with rice could be done if afterwards you clean lapis lazuli with a soft towel instead of running water. White Sage Cleanse: Light the white sage bundle. Run your stone through the smoke of the sage until you feel that your lapis lazuli is cleansed. Visualization: You can also use visualization or “thought energy” to cleanse crystals. Hold the crystal. Focus on it. Visualize a bright white light surrounding the crystal followed by a beam of white light passing all the way through the stone. The “thought energy” generated by you will be transmitted to the stone and this cleansing energy will do the job of clearing the stone of its stored energy. After cleansing your stone you need to Energize it. There are four main methods to energize any stone – Water, Sunshine and Moonlight and also Physical Contact. You should already know, the water method is not a method to be used with lapis lazuli. Sunshine and Moonlight: As the direct sunlight is not beneficial for our magical Lapis Lazuli, it is best to place it in the sunlight during sunrise or sunset, when the sun’s rays are not that strong. And of course, you can leave your lapis lazuli for all night under the moonlight to allow it absorb the power of the moon. Physical contact: Native Americans believe that the best method to energize a gem comes from our body’s energy field when they are picked up and handled or also rubbed between the palms of the hands. Usually, it is recommend to do the cleansing on a full moon. The moon’s energy is unique and strong. 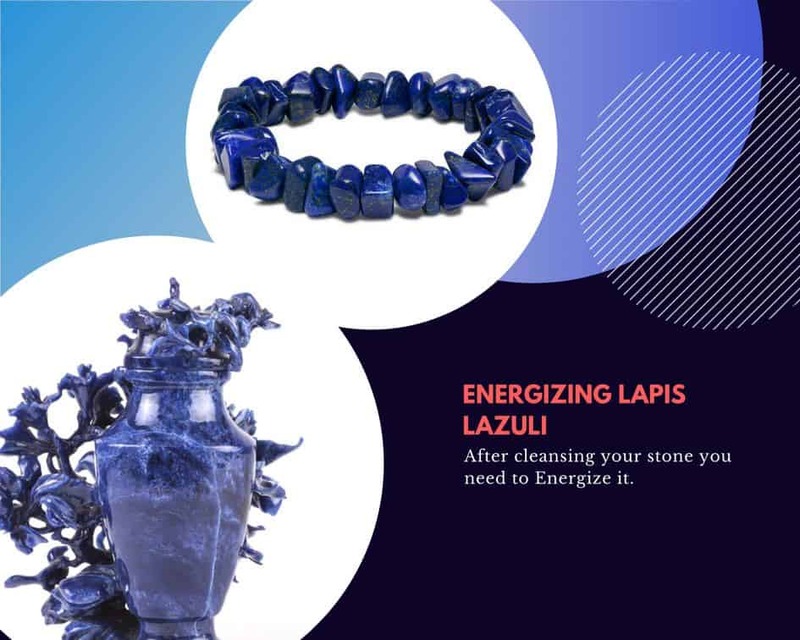 It gives your Lapis Lazuli stone an extra energy charge. Of course, you don’t have to wait for a full moon to cleanse your gem. What is important, is to recharge your gems on full moon days. Ancient and modern astrology affirms that stones have the impact on the destiny, general condition and health which are predetermined by the position of the planets and the constellations of the zodiac. To learn more about powers of lapis lazuli, check our Lapis Lazuli in Astrology post. You can perform any one of these cleansing methods on a new gemstone. Doing a cleanse will keep your stone or bracelet working for you. Cleansing should be done weekly if you have used the stone often or worn the bracelet often. 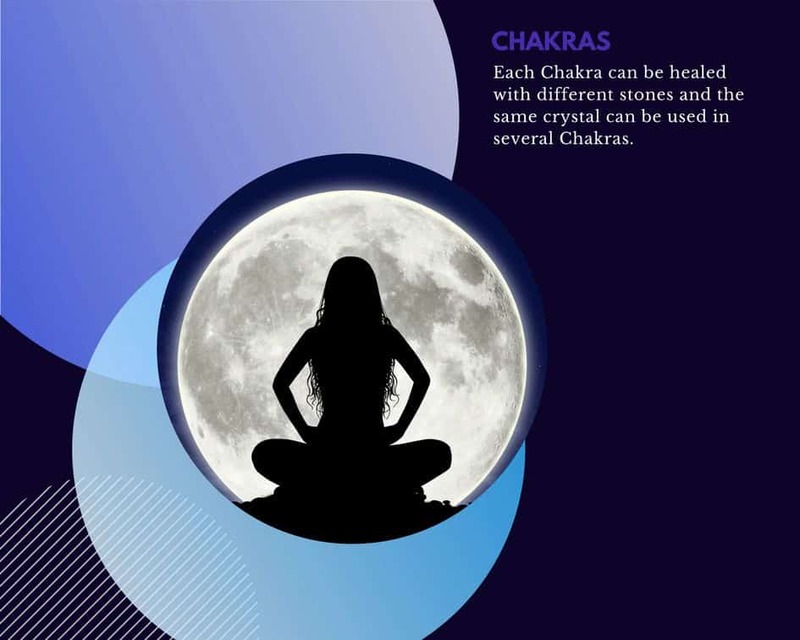 It is important to keep in mind that during Chakra Healing the main thing is balance. Do not overdo. Remember that “closing” your chakras is as important as “opening” them. 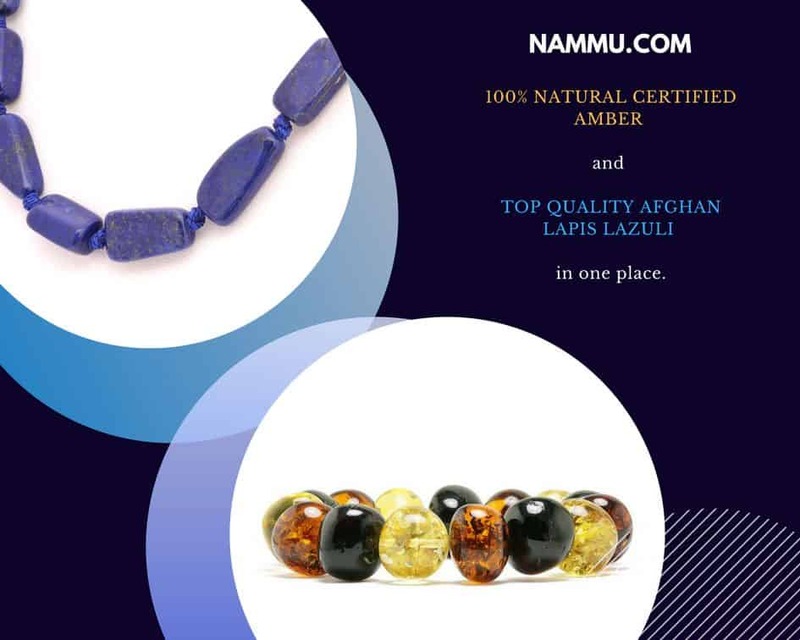 To heal your Throat and Third Eye Chakras remember to buy your Lapis Lazuli healing stone at Nammu.com store. To heal your TSolar Plexus Chakra and Sacral Chakra check our amber collection.